This item can be laminated or put in a plastic pouch for kids to use dry erase markers to orangize themselves to help with executive functioning skills. A picture of the child can be place in the cartoon photo if needed (that is what I did). 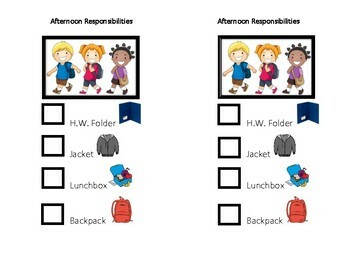 The afternoon copy goes by the closet door, by the classroom door, or in a specific area. 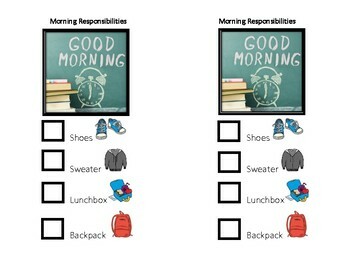 Visuals help readers and nonreaders learn to visualize routines and responsibilities.